Today I got to learn that Philip Nicholas too was an unfortunate casualty of the tsunami title wave that hit Sri Lanka yesterday. At the time of his death, he was holidaying in Arugambay (located in Pottuville) spending Christmas at the Star Dust Beach Hotel. The wave that struck the area had completely destroyed the hotel. Phil was the founder and lead developer for Hibyte Co., a UK based web development company. He came to Sri Lanka in 1999, to work on the Star Dust hotel's web site, and directly gone there at a time when going to Pottuville was unthinkable do to terrorist activities. Ever since then he had fallen in love with Sri Lanka and had worked and lived here since then. 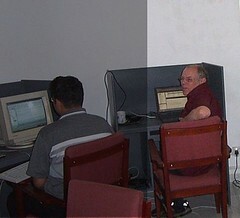 I met Phil towards the end of 2002, when my former company ITABS formed a partnership with Hibyte LK. I worked with him a little over an year on a few projects. He was a perl and DHTML genius. I would say most of my current perl writing styles and even some PHP generic functions were greatly influenced by him. One thing I really admired in him was his appreciation for Sri Lanka and its people. He would often talk of how lucky we are in certain things compared to western countries and showed us things that we took for granted. He had many stories to tell. You were a great inspiration and we shall miss you dearly. To all the thousands of people who their lives, let us pray that they find true happiness in what ever form it may be. Lets all unite and help those in need so that they may have a better tomorrow and live to tell of this tragic incident. I was never scared of the dentist. The sound of the drill nor the injection, which I now refer as to “Lethal Injection!”, didn't bother me. But my ignorance towards the dentist, has finally caught up with me! I finally share the sympathy, and plead forgiveness for I have laughed at you, while you were rightfully frightened to go to THE DENTIST! than usual. Except for the pain of having to tilt my head slightly back for the whole period, the operation didn't really hurt much. There were some complications, as expected, since it is said that wisdom is difficult to obtain as well as remove :) My tooth was surgically removed, after cutting up into several pieces, and the remaining gum sawed together. The numb was still there, as I left the clinic, in a jolly good mood. This was the first time, I had gotten a tooth removed, so I really didn't know what to expect. I couldn't go too far as to get my medicine. The pain started creeping up. I was supposed to keep my mouth shut for an hour, but that wasn't going to work. After about forty five minutes had passed, I took the medicine, but it was already late! The next couple of hours was just pure pain! After taking another supplementary and extremely powerful pain killer, I was finally able to fall asleep. Welcome to virtusa is a phrase I kept hearing all day from many who gave me a warm welcome. Today was my first day at the new office. A new machine was already allocated with a sticker containing my login details. The machine boasted a 2.8GHz processor and 1GB RAM which made me quite content. It was as if they had been waiting for me. I spent the rest of the day remove that other OS, and reinstalling Debian Sarge Linux. The new Sarge installer, which is still beta, turns out to be very user-friendly when comparing with the previous Woody installer. Within a couple of hours I got a very good desktop linux running on KDE 3.2.3. There was a problem with Xfree86 probing the correct monitor frequency for the Samsung SyncMaster 753DF, so I was stuck with 60Hz at 1024x768. Now I must admit a secret. I have super powers which enable me to view 60Hz flicker. This also makes give me a headache so I decided to get the proper frequency values for the monitor. I was too lazy to go around and see try reading the values, which should normally be printed in the back of the monitor. Luckly I found a tool. I could generate the necessary stuff to put into the Xfree86 configuration file. Couple of us were invited for a warm Christmas lunch at the Hiran's residence. Myself, Asanga along with Kanchana had decided to meet up early to get a card and a gift since that's usually the hard part. But when I saw the Lava Lamp staring at me, I thought this is all that's missing from Hiran's high tech home! I mean after all how can a solar/wind powered, wireless, broadband home with a sound space system not have a Lava Lamp? Everyone else agreed so we got that and rushed off. When we got to Hiran's, Marlon and Andre had already arrived with a can of beer in their hands. Surprisingly we weren't that late as thought since these guys had also arrived few minutes earlier. I got myself into a cozy beer, while Kanchana sipped on a delicious home made Anoda drink by Maneesha, of which I too was lucky to have a sip. More guests soon arrived which, included Hirans beautiful sister, who'd come down from UK and Thilani who is sometimes called a crazy girl, if not for Kaushi who unfortunately wasn't to be seen. The atmosphere was filled with cool gadgets. Hirans sister (by now you would have noticed I forgot her name), had a funky Nokia 6230 that comes with a built in mp3/mpeg4 video player among other things. Marlon had brought a cool HP PDA, that had a color display and ran Pocket PC. He was showing some cool pictures he had drawn using Maya as well as how he could play Doom on his PDA. Now a lunch wouldn't be complete without food! and it was delicious indeed. The highlight for me would be the desert :) Manisha makes killer ice creams, in this occasion out of Anooda, which I just cant get enough of. You'd be happy to know that there are future plans to introduce this product to supermarkets WORLD wide by the brand name of Karolis Ice Cream tm. The bownese, too were really good, especially with vanilla ice cream and chocolate syrup. So that's how it went. Its been a couple of days now but I can still taste it! Today is the last day I'm officially spending at ITABS, but I'm not feeling nostalgic nor sad today. After all this is the end of the week and the weekend is coming up right! But more than that, it's because I was feeling sad and nostalgic yesterday ;) Yesterday was my unofficial last day at ITABS, only because today some guys were supposed to be somewhere else and so they decided to do something yesterday instead. Yesterday, I was busy the whole day at a client's location and was hoping to come back to office in the evening for a Linux class. I've got a call around 3:00pm, as I was entering the network server room at the client, from Lakmal asking an odd question "which type of DVDs my writer supports?". Without thinking twice I answered "any type, plus or minus". He then immediately kept the phone. For a second I thought it was odd, but then thought may be he is researching again on the net for a good DVD writer to buy, and got back to work. As I got to office later in the evening at about 6:10, I was in a rush to get to class. To my surprise, the guys had brought me a gift and a card. Channa started making a very touching "thank you" speech, remembering a bit of the past, which made be feel just a bit shy. This was followed by a delicious chocolate cake and good bye wishes. I didn't have much time to drool over any of this, as I was extremely late to start the class. The only thing running on my mind was "I got to finish this today! Some How!". Though a bit late, I did manage to do so. Once I got home, a bit late than usual, I opened up the gift. A pack of rewritable DVD was like Dejavu! I opened up the card. 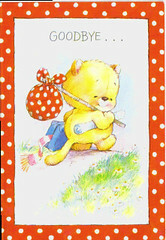 It had a nice cartoon teddy bear, who had packed up his stuff and while leaving looks behind and says "Good Bye". There were some touching stuff written, and I thought "my GOD! these people are going to miss me". Need a 5,000 rupee ticket to use the Toilet! That seemed to be the tone coming out of some of the security guards patrolling the "takaran" gates of CR&FC. Though I would have much liked to use different title for this post, considering the vibrant concert that followed, I can't help myself! If you weren't living under a rock, you would know that Air Supply is in town. I some how managed to squeeze a few minutes to go out and buy two 1,000/= tickets. Like most sensible people I couldn't afford paying 5,000/= a ticket even though Air Supply is such a wonderful band. Apparently the organizers hadn't anticipated that people who bought the 1,000/= rupee tickets just might need to use the restroom. When this scenario cropped up it was just sheer panic! The guard said "You have to go out of the gate and get in from the 5,000/= gate but once you come back we can't guarantee that we'll let you in. You might have to buy another 1,000 ticket". One of the organizers with a tag hanging from his neck also said you can't go out (outside or the toilet). He seems to suggest we just do-it on the ground Sri Lankan style! The guard by the other gate (which is on the other side separated by an iron fence) was understanding, with a slight political tone. "This is your fundamental human right! Tell them to let you out and in when you come back'. This way a couple of us (guys and girls) ping-ponged between the two gates until finally I said "Take us to your leader (organizer)". He was much apologetic and understanding and went as far as chaperoning us through the 5,000/= gate all the way close to the restroom. Now you would have thought this toilet story is finally over and I'd start talking about the concert, but it's not over. While the organizing guy stayed behind, myself and g/f along with another guy and his g/f walked along the pavilion looking for the restroom only to find there is only a male toilet. When we inquired, "Where is the girls toilet, one of the guys said there isn't a separate one and this is for both". Talk about things that make you go Hmmmmm... As we walked in slowly, not knowing what we'd see! a guy walked out with his g/f saying there are separate toilet rooms (which I later found to be separate by a wall ¾ high). Now there was a small queue building up inside the bathroom (consisting of two toilets), with boys and girls waiting in line. When I got my chance I found that the guys toilet door couldn't be closed and worse yet the door wanted to open it self. Free shows for the girls! No fair! Its really inexcusable for the organizers to be this blunt to such basic needs, considering this show isn't charity and they make a thumping profit even after paying Air Supply. It only requires spending a small fraction, call it an investment that will pay off in future concerts as well. So now what about the concert? I'm sorry girls and boys but we are out of time. Stay tuned for the next concert hoping the situation is better by that time or that I don't find it necessary to use the toilet. By now most of you reading this blog already know that I will be exiting my current work place to join Virtusa at the R&D dept. If you didn't know, well now you know why I was making various hints on previous posts! My appointment date at the new place is from the 20th of this month so there really isn't much time left. Today began the handover of things to friends who worked with me. I spent the whole morning with Janaka explaining him the firewall config tool that I was building over the last couple of weeks and getting him up to speed with it. I'm also working on setting up some infrastructure to streamline some of the redundant operations we currently have. Last week I setup a CVS server and today I started to install RoundUp an issue tracking system. I'm still going through the feature list and leaning to use it, but I'm hopeful we can track software bugs as well as customer issues with this. That way I wont have to install a separate bugzilla which in our case is just an over kill! Few more things to wrap up including classes I'm currently conducting on Tuesdays and Thursdays. Today was a busy day for myself and the other guys. I was busy at the UCSC, preparing few lecture notes that I didn't have time to do over the week, as well as conducting lectures and instructing the practical. The other guys were busy at BMICH explaining and demonstrating to the large crowd that turned up for the last day of the ASCIO exhibition. I got a call from Nadeeka around 6:00p asking me when I'd come over there. We had planned to meet up after the exhibition to go out and eat, drink and chit chat. "I'll be there soon" was all I could tell him. The class had just finished, but my good friend Vinesh had come over to UCSC and was trying to setup MRTG , a network monitoring tool for his new office. He had gotten some weird error on Redhat when he had tried it and now I was getting a similar error on a freshly installed Mepis (Debian like). Ah! it suddenly hit me... the FIREWALL, stupid dog! Turning off the the Guard Dog firewall rules seemed to fix it. Wonderful! I can make it on time before the exhibition ends. I got there around 7:00 o' clock and since there wasn't much time decided to check out the Epsi stall again. They had some pretty cool stuff like a slim barebone, Gaming machines, color PDA's with Wi-Fi etc. Met a couple old friends/clients I used to work with so it was all good :) My only regret was not having time to walk in to the Microsoft stall with my RedHat cap on (for the record I almost was going to do that but my friends stopped me). Everything came to a standstill at 8 o'clock sharp as air conditioning was turned off and people started packing. Soon we got to know that we had to leave SBMICH premises and leave behind the stuff to be collected tomorrow. We headed straight to this small Chinese restaurant in Narahenpita, adjoining the highway (you know the really slow highway with lots of traffic lights :P) I thought the place to be quite crowded for a Sunday evening with a lot of chatter boxes spread out across the room. We managed to find a corner table that was big enough for the 7 of us. Some nice, constructive and hopefully productive conversations came out as we drank away a couple of Beer bottles, while chewing away plates and plates of friend rice. Dining time was over at about 11 O' clock and we headed home, hoping to meet again soon. Considering some recent developments ;), I have a feeling we'll be able to keep to this promise. I've really been busy the last couple of days and didn't have any time to write my blog. But in any case except for a few developments, nothing exciting did happen.. that is until now! 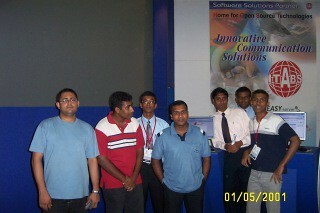 Asian-Oceanian Computing Industry Organization or in short ASOCIO is an exhibition that is usually held else where, and its the first time they are holding it in Sri Lanka. There was a BIG marketing campaign on the media announcing it as the BIGGEST exhibition in South East Asia, with big names like Intel, PC House, Suntel and oh.. almost forgot that company from Redmond sponsoring it. 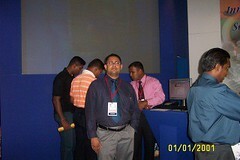 Yesterday I was running around to help setup the LKLUG stall, at SLECC (Sri Lanka Exhibition and Convention Center). 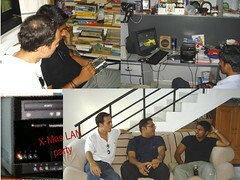 I lent them my Wi-Fi USB gadget, a wireless Keyboard and Mouse, Sound Blaster Live 5.1 card and a power extension cord. So how was the first day which was supposed to be open to Business invitees only? My feeling was that it was just a BIG noise and nothing more. If the organizers goals were to promote networking and business opportunities for the attendees, I think today it failed miserably. Despite having BIG structures, and holding it in two locations which are miles apart, I didn't see much business delegates as planned. Instead there were more ordinary, inquisitive people who had paid 100/- (instead of the regular 60/- for public, but available only from tomorrow). Most people I spoke to from other stalls also felt it didn't really meet their objectives. From tomorrow the exhibition is open to the public so we are expecting a larger crowd. Likely I wont be going to BMICH or SLECC since I am supposed to finish up some other office work.